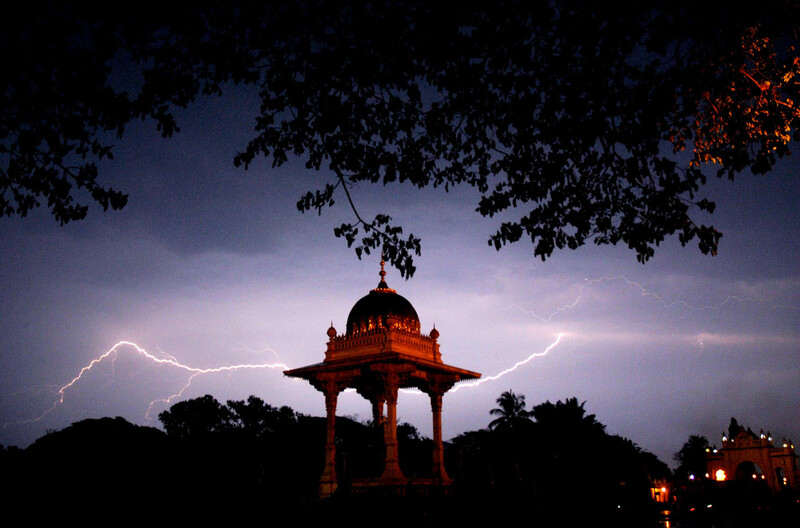 A bolt of lightning strikes a nice continuum with the canopy of the Jayachamarajendra Circle on a cloudy evening, as the lights come on in the main Amba Vilas palace in Mysore on Tuesday. This entry was posted in Mysore-Bangalore and tagged Churumuri, Jayachamarajendra, Karnataka Photo News, KPN, Sans Serif. Bookmark the permalink. ← CHURUMURI POLL: One dish, fewer guests by law? It is H.H. Chamaraja Wadiyar Circle – Grand Father of H.H. Jaya Chamaraja Wadiyar !